How to pose a portrait: 54 creative ideas is an article from Digital Camera Magazine that offers suggestions on how to pose for a portrait. Below are their suggestions for shooting portraits from high and low camera angles. The article also offers suggestions for full-length portraits, seated portraits and facial expressions. I know I can certainly add some variety in how I pose for photos and maybe you can use a little variety, too! 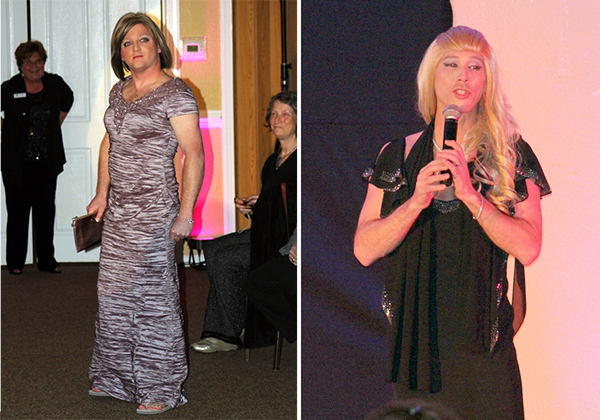 Contestants in the United Way of Scotland County (North Carolina) womanless beauty pageant. The art of the pose for the male 'emfemme'. For this 'femulator' and photographer, it is all about the placement and pose of THE CHIN. If the pose of the chin is not well done, the predominant MAN CHIN shows and spoils the photo. As proof, spot the trans person almost instantaneously on JERRY SPRINGER-- just look for the broad chin! Compare photos of the same 'femulator' wearing 1)a short bob wig, 2)a longer wig that reaches below the 'line of the chin' or ear; and voila, the broader chin is visually disclosed in an instant. Of the 50 or so wigs I have, only ONE is long, and it was my last. Scotland County NC!!? YOW, and no 'bible belt', holier than thou protesters(?) No Klan? ncmarko and I do mean 'nc'. Try out new poses! I just need to get back into the habit of taking more photos. A regular blog just eats photos and has an insatiable appetite. I have found that since going "full time" I have gained in confidence and don't turn to my camera as much as I used to, maybe the photos offered me some sort of validation.